According to Hubert Burda, "In today's media society, in which hundreds of different media compete for the attention of viewers, readers and listeners, a great deal of importance is attached to presenting oneself." In the following essay he goes much deeper than the typical discussions of visual representation in the Internet Age and writes about self-presentation in portraits from Jan van Eyck to Andy Warhol and examines the images people want to have of themselves. Burda is eminently qualified to write on his subject. Trained as an art historian, he is himself a painter, in addition to being one of Germany's media moguls (see "Hubert Burda — Germany's Agent of Change"). In 1993, Burda, synthesizing his experience as an art historian and a connoisseur of fine arts with his understanding of New Media, recognized that the use of digital imaging technology changed the ratio of costs between photography and print in magazine publishing from 5-1 to 1-1. Armed with "Burda's Algorithm" he moved to quickly establish Focus Magazine, one of the great German economic success stories of the 1990s. Today, Burda is the largest provider of German language content on the Internet. "The opportunities of personal representation and self-presentation have become democratised to an extent that would have been unimaginable many years ago," he writes. "Nowadays anyone who wants to draw attention to themselves and communicate to the public an image of themselves can to all intents and purposes do so." In today's media society, in which hundreds of different media compete for the attention of viewers, readers and listeners, a great deal of importance is attached to presenting oneself. Those who know how to present themselves get noticed, and a whole raft of consultants from different horizons make sure that their protégés are presented as effectively as possible. The opportunities of personal representation and self-presentation have become democratised to an extent that would have been unimaginable many years ago. Nowadays anyone who wants to draw attention to themselves and communicate to the public an image of themselves can to all intents and purposes do so. As a publisher in a media company with a global presence, who is confronted on a daily basis with a plethora of images of people portraying themselves to the media, but who has remained in close touch with his field of study — art history – I naturally am always interested in the history of such phenomena. I should therefore like to take a look back at the early stages of modern portrait art and follow its development from then until now from the following perspective: what does the self-presentation of the people being portrayed say about the image that they have of themselves and that they want to convey to a specific community? I take a consciously undogmatic approach to this and pick out just a few significant examples, which I believe are characteristic of the forms of self-presentation we see nowadays. Most of the portraits I present in this paper we know were commissioned. Although there are only a few cases – such as the portrait of Napoleon on horseback by Jacques Louis David – where we know that the person who commissioned the work approved greatly of this mode of pictorial representation, as regards commissioned portraits we can basically assume that those were largely identical to the image that the persons being portrayed had of themselves and wanted to convey through the portrait. My analysis of portraits deliberately does not focus on the great self-portraits of artists, which the genre spawned over the course of the century, from the enigmatic self-portraits of Rembrandt in costume to the inimitable personal accounts of Cézanne and Max Beckmann. What these portraits of artists show bears no relation to what interests me about self portrayals. Because, unlike portraits of members of the middle class, these portraits do not reveal anything about the new self-assurance of a class whose standing had risen, but are rather the expression of an existential wonder of the cosmos, their own lives and the period and environment in which the artists lived. The images I have drawn on for my reflections can be described, to use an expression coined by my professor, Hans Sedlmayr, as "critical forms" of their time. The critical forms approach makes it possible, when analysing works of art, "to draw on extremely diverse phenomena from a source which is the unifying centre of otherwise unrelated, unchallengable factors from art and cultural history." We can thus fall back on "low forms" of artistic expression. The latter in particular enables us relatively easily to create a link with current forms of individual representation. I would like to start with a painting from the early days of modern portrait art, which, in my opinion, is characteristic of all the new possibilities of expression in this mode of painting: Jan van Eyck's "Man in a Turban", 1432. 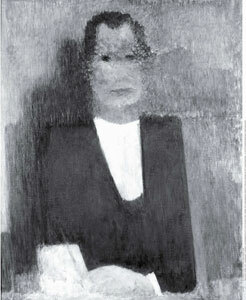 This painting is generally regarded by more recent research as a self-portrait of the artist. 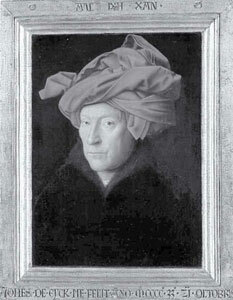 According to Hans Belting, the gaze of the man in the portrait is so self-assured and inquiring that one can scarcely take one's eyes off him,  and the headwear, a bulky red turban with "a strangely bound turban", denotes "the vanity of the artist in relation to his self-portrayal ".The portrait of Jan van Eyck whom Hans Belting holds responsible for the invention of painting, bears powerful testimony to the new self-assurance of a class whose standing had risen and their pretension to express this in their portraits. The modern portrait, which Jan van Eyck's self-portrait embodies, was born out of the reciprocal tension between the established nobility and those rising to the middle-classes. Whoever managed to climb the social ladder automatically won the right, so to speak, to have their own portrait painted, which in earlier times had been the preserve of the saints. Using a few examples, I would now like to show how those classes which were climbing the social ladder at that time used the portrait to give visibility to their claim to power and status, how the painted portrait lost this function following the invention of photography and how the portrait, as a result of the opening up of the media to anyone wanting to get themselves seen, has been superseded by other forms of expression. 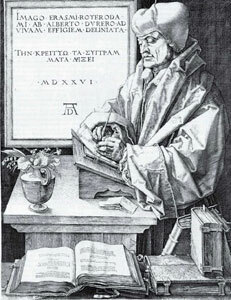 Dürer's famous engraving of Erasmus of Rotterdam reflects perfectly the rationale behind portraits of the middle classes at that time, namely that they were intended to be the staged imago of an individual: On the one hand, the engraving is a portrait and, as such, resembles Erasmus, but at the same time it also reflects, in the way that it presents this great humanist, his personal, cultural and historical importance. Dürer also portrays studiolo decoration, like those seen in many of Hieronymus's works, and in doing so identifies the person being portrayed as a scholar. The use of the copperplate engraving technique, which emerged in the Upper Rhine region at around the same time as the oil paintings of the van Eyck brothers, and was, along with the woodcut technique, the first pictorial medium that found an easy way of making copies, indicates that the portrait was designed to convey a certain image of the humanist to interested members of the public. The inscription on the board next to Erasmus provides an additional explanation as to how the picture should be interpreted: the artist is disassociating the imago and the effigy of Erasmus and points out to the beholder in Latin and Greek that the real image of Erasmus can only be understood through the works that are pictured in the foreground. 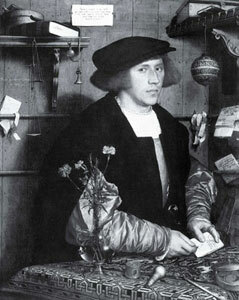 An excellent example of the great claim that middle-class merchants, who had now moved up the social ladder, laid to having their portraits painted is Hans Holbein's portrait of the merchant Georg Gisze, dated 1532. There is no detail in this portrait of a proud young man that cannot be attributed to this claim for his standing in society to be represented, from the Oriental rug, the Vase filled with cloves and rosemary, the graceful balance and the golden table clock to the hand stamp bearing the tradesman's mark. Gisze became, as a result of this portrait, a Mercator doctus, a merchant on the cutting-edge of society at that time. He was born in Danzig, but wanted to be presented as a successful merchant on the London trading exchange in order to convey a certain image of himself to the inner circle of merchants in the City. The contracts and many other objects surrounding the merchant are meant, above all, to mark him out as an extremely credible person in money matters and a good connoisseur of world markets. This was of great importance during the period of rule of Henry VIII, since it was at this time that the first wave of globalisation was taking place. Portrait presentations of the recently elevated middle classes led to the creation of yet another genre in the form of the Dutch group portraits. 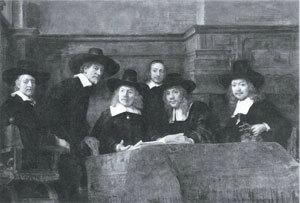 An excellent example of this is Rembrandt's portrait of "The Syndics of the Clothmaker's Guild", dated 1662, which hung in the main room of the guild in Amsterdam along with five other group portraits of its members. At this juncture I shall disregard the research into the significance of this painting and focus on the group portrait in terms of it being a critical phenomenon of Dutch portrait painting. Through this genre something came to pass in middle-class Holland that was an anomaly in the absolutist Europe of that time: The individual was portrayed as a member of a like-minded group and constituted within this group its "imaginary, ideal image, namely that of a harmonious, conflict-free relationship between individuals and the community ". The recently successful elites felt at their strongest within a group and, through this type of group portrait, they set middle-class self-assurance in opposition to the absolutist court society. At around the same time that Rembrandt painted the The Syndics of the Clothmaker's Guild in Amsterdam, the 23-year-old King of France, Louis XIV, was informing his ministers that he would be taking control of state affairs, thus becoming Head of State, before going on to dismiss most of them. In keeping with his motto, "In my heart I prefer fame above all else", he later had a portrait of himself posing as the absolutist ruler painted by Hyacinthe Rigaud. 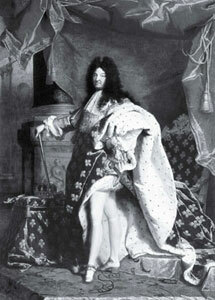 The portrait shows the 63-year-old ruler in a pose that expresses perfectly his claim to absolute power: He is draped in his heavy royal blue coronation robes ornamented with the French fleur-de-lys, has one foot placed slightly to the fore, his right hand on his sceptre, his left resting on his sword. A truly regal posture and an appearance that one could hardly imagine more magnificent. The highly theatrical nature of the depiction conveyed by the painting is reinforced by the powerful drapery that the king is posing in front of, as well as the light that is being projected from the foreground as if from a spotlight. Similarly theatrical in nature, but also drawing on the tradition of painting portraits of emperors on horseback, is Jacques Louis David's portrait, 100 years later, of the then 31-yearold Napoleon Bonaparte, who at that time had headed a coup that put an end to revolutionary rule and had established himself as First Consul and Head of State. 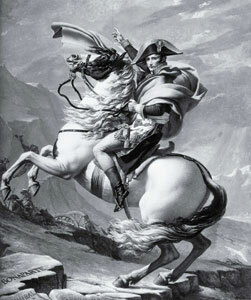 The portrait shows Napoleon in a flowing cape on a rearing white horse. His right hand is pointing towards the St. Bernard Pass, which must be safely crossed with an army of 30 000 men. On the rocks in the bottom left-hand corner his name, as well as those of his great role models, Hannibal and Carolus Magnus, are hewn in the stone. Legend has it that Napoleon did not cross the Alps on the back of a noble horse, which would barely have been able to stand up to the ice-cold conditions of the journey, but rather on the back of a mule. However, this portrait is not meant to be an exact depiction of his crossing the pass with a huge army, which was a heroic act that secured victory for the French army over the Austrians. The portrait of the Emperor on horseback was supposed to depict the First Consul's claim to political power. In Napoleon's eyes, David had found such a convincing way of doing this that he commissioned him to paint three replicas of the portrait. The portrait as an expression of seeing oneself as a ruler reached a pinnacle with David's magnificent portrait of Napoleon, but this was a solitary success since, by this time, the heyday of portrait painting had already been and gone. A period of technological progress had opened, which was to leave its mark very firmly on portrait art. In 1826 in Chalon-sur-Saone Nicéphore Niépce took the first ever photograph with an exposure time of 8 hours. This invention was to spell disaster for French portrait painters. It has been estimated that at that time around 20 000 painters in Paris alone depended on this for their living. Over the next 15 years, over half of them would find themselves out of work. People who wanted to have their portraits taken felt that a photograph could give them a more faithful visual representation of the image of themselves that they wanted to see than a painting could. Henceforth, fewer and fewer people wanted to have their portraits painted, especially as photography techniques were developing so quickly that by 1841 the first major photography exhibition had been held in Paris. Over the next few decades, many figurative paintings by artists such as Delacroix, Manet and Cézanne bear eloquent testimony to the artist's quest for new outlets for his work. The Munich-based artist, Franz von Lenbach, found an original and clever approach, as shown in his portraits of Chancellor Bismarck, which achieved a successful symbiosis between photography and painting. Lenbach, who brought a touch of genius to Bismarck's portraits, hit upon the public taste of that period. His portraits, which were marketed, so to speak, in the form of postcards and albums, alluded to the political greatness of a great man from a great era. However, as of 1900, artistic tastes ("Kunstwollen"), as defined by Riegel, headed in a completely different direction. With the emergence of a new generation of artists and paintings by Klimt, Schiele, Kokoschka, the French Fauve painters and the "Brücke" artists from Dresden with Ernst Ludwig Kirchner at the fore, portrait painting experienced a renaissance and developed a quality that set it apart from photography, which at that time still only afforded very limited possibilities. The most innovative artist within this genre was Picasso, who experimented with every option possible in portrait painting, and came up with such diverse creations as his 1906 portrait of Gertrude Stein and his 1941 portrait of Dora Maar. The extent of the difficulties that the demise of realism spelt in general for panel painting as a medium of representation can be seen by taking a look at Georg Meistermann's portrait of former Chancellor, Willy Brandt. The painting constitutes a critical form of the representative portrait insomuch as it is representative of the artistic tastes of a particular period, but it provides virtually no recognisable feature of the person being portrayed and fails to reflect his standing. At any rate, and this was the noise coming out of Willy Brandt's inner circle at that time – he in fact never officially commented on the portrait — , his blood-red, virtually abstract portrait meant little to him. His successor, Helmut Schmidt, had the portrait removed from the gallery in the Chancellery, and Helmut Kohl replaced it with a realistic portrait of Brandt. At the same time that Meistermann was putting the finishing touches to his unpopular portrait of the Chancellor, Andy Warhol was reinventing the portrait genre by developing a technique that combined the technique of the photographic image with silkscreen printing and acrylic overpainting techniques. His works, which bestowed an icon-like aura upon the people he portrayed, became the authoritative portrait mode of a new international community of celebrities. Warhol was particularly interested in how reality was reflected in the visual world of the mass media. 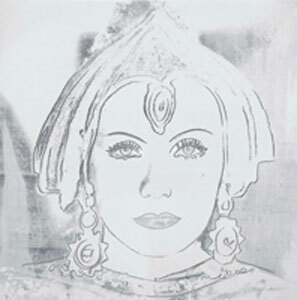 Warhol had a special interest in the legends of Hollywood stars of past and present, such as Greta Garbo, Elizabeth Taylor und Marilyn Monroe, which the young, smalltown boy had grown up with. 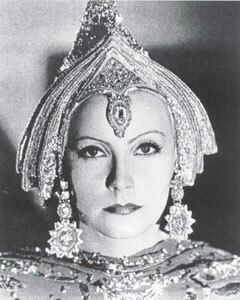 The visual repertoire of the celebrity cult first emerged in the 1930s with the emergence of the new stars of talking movies, such as Greta Garbo, Marlene Dittrich or Jean Harlow. Warhol was fascinated by the uniformity of the make-up and presentation of star portraits, and how, apart from minor changes, this has remained the case right up until the present day. Warhol got the pictures he used to create his silkscreen prints from film posters, illustrated photos and the photo pages of tabloid newspapers, which reported on the most recent events in the lives of the film stars of that era. The iconic portraits, in the style of star portraits, which Warhol made of internationally renowned celebrities, were extremely popular. Warhol had evidently tapped into the pulse of the age. The way in which he portrayed people using technology also had a great influence on advertising. The urge for visual representation has remained right through to the present day. However, visual arts and painting no longer play an important role. For members of the media society the only question of importance is: "How often do I appear in the media, in which ones, and how often am I quoted?" The whys and wherefores of this can vary greatly. An actor's photo is placed on the front cover of a TV magazine in order to increase the audience ratings of a given programme. A politician, who is in the public eye thanks to his appearances on a host of talk shows, is interested in enhancing his own popularity ratings. An author, whose latest novel is discussed on a book programme, hopes that this will lead to more copies of his novel being sold. Andy Warhol had a profound conviction that "Images need to be shared". The better known your face is in the new economy of attention seeking, the higher your market value and your personal rate of return. "How many entries in Google do you have?" is a question that today's twentysomethings ask each other in order to check how important they are. The aim of other questions, such as "How many people read my weblog and respond to it?" or "How many photos are there of me on the Flickr platform?" is to ascertain how one's role and standing are being portrayed and relayed. In fact, the search engine A9 contains a tool that enables you to find all the written content and images that have been published about you by online newspapers and magazines. The boundaries between the public and private spheres are becoming increasingly blurred. New media are thereby able to take over old functions, such as the large advertising billboards with portraits of famous personalities splashed across them that can be seen in all major cities across the globe. One can, with a bit of imagination, see in this trend a continuation of the mural paintings of the Renaissance, with the notable difference that today's images generate advertising revenue. The portrait photo of prominent figures has become an advertising medium that draws our attention towards a brand or a product and makes them more valuable and desirable. During the 2006 Football World Cup, the sportswear firm Adidas, which makes the German football squad's strip and is one of the main sponsors of the World Cup, showed portrait images of the football stars on its payroll, such as Michael Ballack, Oliver Kahn und David Beckham, on TV, in print and online media and on huge outdoor billboards. The estimated cost of 500 million euros to run this campaign shows how much influence prominent figures are deemed to have on the image and turnover of a brand nowadays. More than two thousand years after a ruler, Augustus, used for the very first time the minting technique to bring his face to the people, the possibilities for getting one's picture shown in public have increased many-fold. Print media, TV and the Internet have teamed up and have made the motto of the hippie generation of late 60s San Francisco — "Expose yourself!" — a reality. Nowadays anyone who wants to draw attention to themselves can. The Internet enables us to become multi-media media producers. Since it started up a year ago, over 50 million people have already uploaded personal short videos onto the video platform YouTube.com. The portrait which enabled the new middle-classes of the 15th century, following their rise in status, to fulfill their desire for representation, has experienced many changes over the centuries. These have related on the one hand, to developments in society and, on the other, to technological innovations. However, the claim to representation made by the aspiring classes has remained and can serve as a marker for the development of portrait forms over the course of the 21st century. To me, the most remarkable result of Renaissance-era portraiture was how it coincided with the rebirth of the notion of an "individual" at all. Just as Augustus's Ancient Greek contemporaries invented the formal definition of the individual in the first place, the Renaissance — as its name implies — "rebirthed" this notion along with new styles and technologies of representation. In the Renaissance, individuality was not limited to the art patron who could afford to have himself painted, but defined just as powerfully by the spectators to these paintings. The invention of "perspective" painting, itself, conveyed the importance of an individual's point-of-view of a given landscape, and served as a valuable allegory to the emerging notion of individual experience, opinion, and even rights. And of course, the Renaissance was followed by the Baroque, where the uniqueness of each individual portrait would be even further celebrated by an ornate physical frame, and then the Enlightenment, where the idea of individuality would crescendo with the expression of every man's opinion in the form of a vote. But, up to this point, the individual member of society-at-large is being defined more by his response than his expression. Right through the age of broadcast media, it is the elite who have the opportunity to get their image in a painting, on a movie screen, or in the TV set, and the vast majority of "individuals" who merely get to have an opinion on that person or image. And then, to voice that opinion through consumption or voting behavior. As Burda suggests, the advent of interactivity and online publishing changes that equation. Individuality is no longer defined by what media we consume, but by what we produce. Today, the amateur blogger, podcaster, or YouTuber can post his image just as potentially far and wide as a king or media kingpin of ages past. The key distinction, of course, is that "potentially" part. The relative scarcity of imagery in a top-down media universe — from the era of the printing press and portraiture to broadcast television and Warholian silk screen — made it easier to guarantee reaching a wide audience. Today, the relative scarcity of eyeball-hours compared to media being produced can lead, as Burda poses, to a sense of self-worth dependent on hit counts: "How often do I appear in the media, in which ones, and how often am I quoted?" While I agree with this part of Burda's assessment, I'd like to suggest that this particular dynamic results from applying a renaissance-era notion of individuality and worth to a very different era. While the original renaissance celebrated the "individual," we may be moving into a cultural era that favors the collective or the network over individuality. No, we don't see a whole lot of evidence for this in the current, adolescent, exhibitionist culture of YouTube. But I do believe it is the logical next step for a generation growing up with fame and individual recognition as such clearly temporary and ethereal phenomena. LonelyGirl14 on MySpace, famous this year for her self-searching videos, will be forgotten by next year and replaced by LonelyGirl15. And as the millions of former "individuals" reproducing their images online get used to this temporality, their attention will turn instead to the project they are building together. The network itself will become more interesting as a collaborative creation than any particular individual within it — just as museums became more interesting than any of their individual works. And it's then — during our own version of the Baroque era — that we'll find out what mass enlightenment might really be about. I think photographers like the story because it suggests that one of the earliest instances of egalitarian photography transcended the function of realistic documentation. It seems to me something similar is going on with the Internet at this time. There are a cluster of portraits surrounding the typical user online, and yet each of them is highly specialized and ritualistic, and actually has very little to do with the person as a whole or as an individual. The underlying environment is the same as in the story about photography: we are experiencing a very early, awkward version of a new media technology. One of the online pseudo-portraits is the attention-seeking self-portrayal now expected from all of us on Myspace. (I regularly get complaints that I haven't put one up.) Since there are only a few archetypes, ideals or icons to strive for in comparison to the vastnesses of instances of everything online, quirks and idiosyncrasies stand out better than grandeur in this new domain. I imagine Augustus' Myspace page would have pictured him picking his nose. Then there's the involuntary portraiture of marketing profiles compiled automatically by companies like Google, credit rating agencies, and other firms that make their money by enumerating personal differences. These are portraits of ourselves we often aren't able to see, and many of them wouldn't be readable by a person anyway. There is, however, an emerging class of digital self-representations that interests me a great deal and gives me hope. Consider Second Life, where people are represented as avatars. I have high hopes for avatars — these are puppets or digital costumes worn in virtual environments by the individuals who design them. One interesting quality of avatars is that the design space is vast enough that an individual can avoid becoming lost in the clutter of other people's imaginations without an enormous amount of effort. Also, avatars aren't just a digital version of something that came before, like a photograph. This fact frames a rare instance of primal freedom for digital culture. Since there wasn't a flood of classical avatars from the 1960s or any other period, avatars aren't burdened by cultural legacy from the "old media." Although a lot of people on Second Life choose somewhat cliched avatars, particularly that of the prostitute, those who want to stand out are still able to, despite the growth of the site. This is an important experiment. Maybe it is possible to avoid the commoditization of individuality that is common in sites like Myspace. 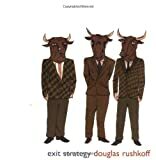 Douglas Rushkoff's response demonstrates why it is so important that the means of self-portrayal become as good and as rich as possible, as we climb up the fateful ramp of Moore's Law in the sphere of culture and public affairs. In retrospect, the historical periods so vividly described by Burda can be seen as kaleidoscopic structures in which the relatively small number of portraits that could be brought into existence had innumerable additional lives as reflected surrogate portraits, like those pseudo-portraits of the old-West. The further back in time you go, the fewer widely-portrayed people there were, going back to the singular instance of Augustus. But with each development in the art of portraiture over the centuries, the many un-portrayed individuals who comprised the masses were ever more shaped by the iconic or archetypal idea of the individual conveyed by the portraits at the center of the kaleidoscope. In that last gasp of centralized media which we are experiencing now, it is still possible to watch grown men go into a theater and identify with, well James Bond, Borat, or whoever, but there are a relatively small number of choices. The phenomenon of the hero (or anti-hero) has been encouraged at least in part by technological limitations — whether broadcast by Homeric bards in ancient times or more recently by cable TV — but in all cases from the center of the kaleidoscope. When the Internet replaces all the mirrors in the kaleidoscope with display screens, there are still as many images. Now each image is actually a portrait of someone, but alas those many portraits have lost their potency. There is no more resonance — only, as Rushkoff and Andy Warhol have said, a skittering progression of attention to transient fragments of what might be people. Unless self-portrayal gets good enough to sustain the individual against the onslaught of the digital collective, the individual will suffer and perhaps die. This is both an artistic and technological challenge. Rushkoff, it seems, and a number of other edge.org habitues celebrate the digital collective and look forward to it, because for them it provides a sense of destiny — a religion. As everyone around edge.org knows by now, I think the emerging digital collective is more likely to be cruel and idiotic and I prefer to celebrate individuals. At any rate, the future of digital portraiture —in particular the question of how luscious and vastly varied it can be — will be central to the unfolding contest between individual, heroic people and digital triumphalism, and I am rooting for people. Hubert Burda's creative synthesis of ideas and images of the human desire for "self portrayal" reminded me of my earlier studies of shyness among adults. There are many reasons why anyone becomes and remains shy over a lifetime, but among the fascinating aspects of shyness are those that relate to the public and private representation of the shy self. Most shy adults are also introverts, preferring solitary to social activities, but our research uncovered the previously unrecognized type of "shy-extroverts." These men and women are privately shy while presenting a public persona as outgoing and not shy at all. They have learned the basic skills of social interaction, of effective verbal presentation, sufficiently well to conceal the inner anxiety and stress accompanying many of their performances. Indeed, some of them are in the public limelight as entertainers, notably comedians, and television and film personalities. They shine when they are in their power domain, when the situation is highly structured with everyone playing scripted roles, and especially when they are in charge. The journalist or talk show host asks the questions, sets the tone and the pace of the interaction to limit spontaneity. However, when the TV camera's red light turns off, or the interviewer's pad is closed, then their power spot is dimmed. Our shy-extrovert abhors freedom and intimacy and unplanned actions, and so tries hard to avoid such situations as cocktail parties and interpersonal encounters. When forced into them, it is likely that self-lubrication with alcohol is the preferred medication. Consider the consequences when celebrities who are both shy-extroverts marry and must cope with their repeated intimacies, often painful and thus to be avoided. What is common among both kinds of shy people, the more common introverts and the rarer breed of extroverts, is that they do not want to be seen by others who are likely to be evaluating them, and always presumed to be critical. Yet, they desperately want to be noticed for those few qualities and talents they accept as their own, as special. It is the dilemma of wanting to be anonymous at the same time as wanting to stand out, to hide in a crowd and to be the lead actor on life's stage. Among the many people I have worked with in group therapy for adult shyness at our clinic in Stanford University, the majority was reasonably attractive, above average in looks. Nevertheless, virtually all believed that they were unattractive, unappealing. Most indicated that they rarely looked at themselves in the mirror, often retaining a self-image from an adolescence long gone by. Popular American comedienne Carol Burnett told me that she had no problem doing comedy on a stage before huge audiences despite her often intense shyness. Her problem was when she had "to sing a pretty song, in a pretty dress, as a pretty woman" on her weekly television show. To do so, Burnett had to imagine that she was one of her favorite attractive singers or movie stars, to internalize their beauty as her own for that moment. It is surprising how many shy people characterize their condition as living in a silent, dark prison of shyness. They unconsciously assume the dual roles of guard who imposes restrictions on their freedom of action, speech and association, and that of prisoner who meekly rebels but gives in and accepts those imposed limits. My investigation into the causes and consequences of shyness was stimulated by the experience of the Stanford Prison Experiment in which young men playing roles as prisoners and guards quickly became those roles, surrendering their freedoms when prisoners and constraining freedoms when guards. Another interesting aspect of self portrayal in that study was the belief by the prisoners that the guards were chosen by our staff because they were bigger, when in fact, random assignment had eliminated size differentials between these two groups. Their inferior status translated into a reduced portrait of self as prisoner. The power of situational forces to transform human character and imagination is the subject of my new book, The Lucifer Effect: Understanding How Good People Turn Evil. It shows how the behavioral context can exert powerful influences on ordinary people to become perpetrators of evil, or be guilty of the evil of inaction, or ideally to discover "the banality of heroism" in taking action to challenge injustice. How people see themselves is often conditioned by the nature of the situations in which they are immersed, chose to enter, or are forced upon them. Social situations frame the mirror on humanity's wall of who is fairest and ugliest of all. It is refreshing to see such a piece on Edge and I very much commend Hubert Burda for adding this material, because I think there is far too little of it in that vein: looking backwards with concrete examples in history, to gain a larger view of where we have come from, looking for parallels and analogies to where we find ourselves today, and then extrapolations — if not at least reasonably educated guesses — as to what that may mean for the future. Burda's essay focuses on self-representation over a 500 year span with an eye towards the hot topics du jour YouTube, MySpace and FaceBook as merely the latest incarnations of individuals trying to leave their mark on this world. The desire to do so may be innate, but so far-spread is the ability to do so now, that the old adage of Warhol is turned on its head soon: "In the future, everyone will be anonymous for 15 minutes". It is a wonderful self-referential recursive nod to Hofstadter's "Gödel, Escher, Bach", in that Burda himself is choosing to spend precious mindspace not on MySpace but to present himself on Edge. He, being used to 2 megawarhols of exposure as one of the giants in publishing, appreciates the ability not to merely draw attention, but to redefine how this rather small subset of the public may view him: not merely a mogul, but an art historian and painter as well. This too is another thread weaving through the ages, which is represented by the very individuals Burda uses: there have always been special individuals pushing the envelope. And these examples, Jan van Eyck, Albrecht Dürer... are especially noteworthy examples of this category, sadly underappreciated by almost all of the current writers and thinkers, let alone John Doe in Anytown. And not just because Jan had a brother named.... Hubert. Van Eyck: To put it in perspective, this is the year 1433, long before Columbus or Gutenberg. And perspective itself had barely been 'invented' (Brunelleschi in Italy, as Burda mentions Alberti, his book was dedicated to him) and just a handful of artists had adapted it. Van Eyck would become one of the early masters of perspective. In fact, even just depicting reality-as-such was still an almost unheard of 'new fangled idea'. To show normal people in their surroundings, including the everyday objects of daily use, was probably as revolutionary as any cubism, impressionism, or other-isms, many generations hence. Van Eyck would be revered later as one of the most descriptive sources of that period. And aside from the choice of content, it is also the manner in which the painting is executed: Realism itself was reaching an almost photography-like quality. Van Eyck was one of the very first to assemble a real vocabulary of features and techniques to create snapshots that surely must have seemed as amazing in the early 14 hundreds as real photography about 400 years later. His use of highlights and cast shadows, materials from wood to leather, linen to brass, even the furry hair of animals and mirrored surfaces, which also had just appeared for the first time. Even more basic: the very tools themselves were unheard of: tempera paint (that is 'pigments in a solution') were high-tech still, when Van Eyck began pioneering the much more involved but also more powerful technique of real oil paint. Van Eyck may not be the singular "inventor" of oils, if such a thing can even be attributed to an individual, but fewer than a handful of examples are known before him, and his optimization of the technique over 20 years makes him the pioneer most often mentioned in the context. He also added metal effects like silverlining for spot details. But as if all these amazing achievements were not enough, it is on a more abstract level that Johannes van Eyck has established himself as one of the early Masters. Long before Raphael, Michelangelo or Leonardo were even born, he was one of the first to use symbolism and clever hidden meanings in the designs, expanding on the pure religious representationism of the few precedessors in the genre, such as Giotto. There are dozens of details, half hidden objects, obscure figurines, tiny reflections aside from the already mysterious expression on the two faces in his "Arnolfini" painting, an enigma well worth seeing in the National Portrait Gallery, London. And even the flourished signature on the wall, "Johannes van Eyck was here" remains as unusual as his motto "Als ik xan"- "as well as I can..." and one more time, he is a pioneer: one of the first ever to sign and date his paintings. Albrecht Dürer: one of the most outstanding individuals pushing the edge in those days. With outstanding talents in drawing, etching & painting, he tried to further his knowledge with the only equivalent to 'surfing the net' at the time: he physically went on learning excursions. At age 18 he spent 4 years on foot, horseback and carriages to visit the best artists along the Rhein, over the Alps to Innsbruck, Trient and all the way to Venice, which he reached — consider that: just as Columbus sailed towards America. He studied Mantegna, and was in long written exchanges with Raphael, who sent him drawings! What a life that must have been, as he became well known for his ultra precise workmanship (one should google the hi-res versions of his "Large Patch of Grass", or "the Hare", or muse over his depiction — sight unseen — of the very first rhinoceros ever brought from India). He was present at the coronation of Kaiser Karl and even met Martin Luther. He also wrote books on measuring, how to build cities and castles and four volumes on nature and "human proportions". Some called him the Leonardo of the North. Hans Holbein: there too are beautiful examples of unprecedented new territory. And what amazing lives: Holbein went from Bavaria to Switzerland, France and then to England, where he ended up in the court of Henry VIII. He painted the famous portraits of the king, as well as Anne Boleyn (who had 6 fingers, incidentally), Jayne Seymour and Sir Thomas More. The most amazing image may well be his "Ambassadors", which absolutely floored me in the National Gallery in London. I had seen it in print, but not realized the 2 by 2 meter size of it, and on it the many unusual and photo realistic depictions of objects: globes, books, a lute, a sextant, sundial and many more, all very carefully arranged. According to one recent analysis even so carefully arranged, that the positions of the globe, sundials and passages in the books all define the exact time and date, April 11, 1533. And in another milestone achievement, reminiscent of Escher but preceeding him by 400 years, is an anamorphic hidden skull, laying on the floor like an odd carpet. If the observer crouches to the far right in front of the image, there is a tiny crucifix in the upper left corner. Gazing at the small figure will "decode" the perspective skew and the skull is in plain view. Holbein fell out of favor with Henry the Eighth, when princess Anna of Kleve, who the king had intended to marry "based solely on her beauty in the painting by Holbein" (! ), turned out to be 'quite plain' in real life. Another early case of images belying reality, avatars not looking like their owners and early PR not always working as intended;) The point here was not in the least to race through miniature biographies, or course, but to point out that the very examples Burda has chosen are all related in another sense: they were brilliant minds, amazing individuals, each going far beyond the "normal" standards of their day. They were pioneers and searchers, thinkers and writers....frankly they were Edgies in their own time. I find it fascinating to think what they would have made of the tools of today, but also how their skills could translate, if they could survive? Would Dürer be modelling in Cinema4D now? Conversely, I find it equally amusing to think of most of us in this group to be transposed in time back to their day, how we would deal with the truly dark ages around us. History can be utterly fascinating and littered with heroes that are plaincool. There are plenty of times I can have doubts over mankind, the rampant spread of mediocrity, the scary reality of zapping through the news and random channels for just a few minutes. But count your blessings. How much harder did they have to fight back then: Holbein died of the Black Plague. In his essay, Hubert Burda makes a very important and compelling observation which provides a new and better insight for understanding one of the most important driving forces of the Internet. Tens of millions of users are spending time creating content that describes themselves, their preferences, their appearence, their activities. You can find it in blogs, videos, sites, etc. 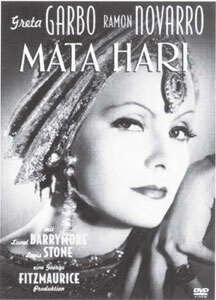 Burda makes the interesting analogy between self portraiture of earlier times and this sub-segement of self publishing. His insight wraps My Space , YouTube, blogs, and personal profiles under one new category: "self portrayal". We knew that User Generated Content is huge and self publishing is huge. Now we understand that the biggest segement of these two phenomena is Self Portrayal. The Burda insight can be summed up as follows: "I am self-portraying, therefore I am."